This document specifies the workflow and basic functionalities used by crowdfunding platform to process payments with MANGOPAY’s API. For specific needs, please contact our team. PROJECT OWNER User who owns a project. CONTRIBUTOR User who contributes to a project. CAMPAIGN Period during which a project can be funded. FEE Commission calculated and collected by the crowdfunding platform. FEE E-WALLET E-wallet owned by the crowdfunding platform to collect fees. 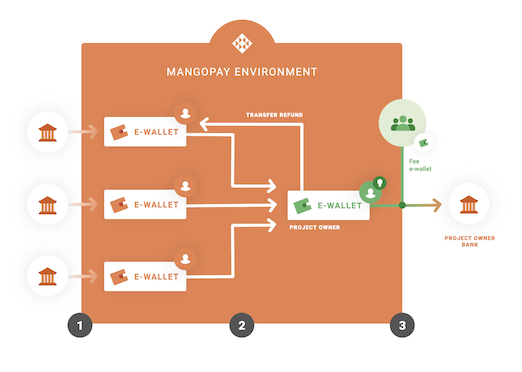 MANGOPAY is a payment solution which enables crowdfunding platforms to easily process third-party payments. The typical workflow is described below. 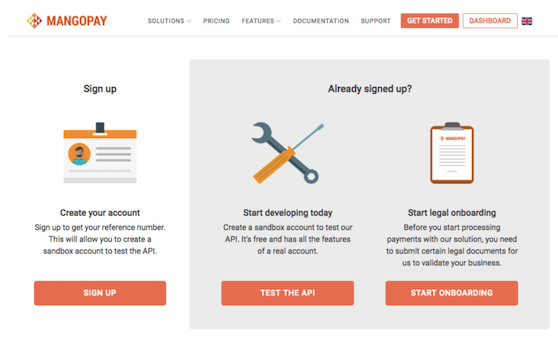 Project owners and contributors are indistinctly registered as users within the MANGOPAY API. Create a project owner with the following API call. In this example, the project owner is a natural user. Please refer to our documentation to create a legal user. Register the project owner's bank account to payout the funds from his e-wallet(s). European regulation requires you to create and submit project owner KYC documents. Create a contributor by repeating the project owner's creation process. Once again, contributors and project owner can be a natural person (natural user) or a legal entity (legal user). Create a contributor's e-wallet by repeating the project owner's e-wallet creation process. Project owners and contributors have now been registered within our API. The next step is to send funds to a user’s e-wallet. User contributors pay into their respective e-wallets but funds should NOT be escrowed there. You should directly transfer the funds to the project's e-wallet. As a crowdfunding platform, you may manage funds between contributors and project owners. MANGOPAY gives the possibility to refund contributions to failed crowdfunding campaigns, either partially or totally. Create one or several transfer refunds to allow the contributor to reinvest into another project. Alternatively, refund the credit card payment (transfer refund then pay-in refund). A transfer request allows you to move funds from one e-wallet to another. In the crowdfunding flow, funds will be transferred from the contributor’s e-wallet to the project owner's. The last step of the crowdfunding transaction flow is the payout. Create a payout from the project owner’s DebitedWalletID to the project owner's bank account. The crowdfunding platform can collect Fees on any transaction (pay-in, transfer, pay-out, refund). Platforms fees are automatically placed on your “Fee e-wallet”. Fees are calculated and owned by the crowdfunding platform. Find out more here.